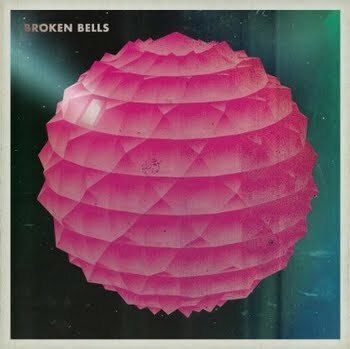 In a lot of ways, Broken Bells (a tandem bike of low-key electro-rock ridden by The Shins' James Mercer and producer Danger Mouse/Brian Burton) sounds precisely like the logical follow up to The Shins 2007 album Wincing the Night Away. It is an album that fleshes out the concepts established by the tracks "Sleeping Lessons" and "Sea Legs" (and to a lesser extent "Phantom Limb"). Mercer's multi-register singing ability and often philosophically dour lyrics present themselves again, but this time to a more spare musical arrangement. Where a company of musicians is replaced by synthesizer, looped tracks and an emphasized beat. After all, Mercer showed the ability to stretch the boundaries of The Shins indie rock premise. Starting with classics like "Caring is Creepy" and "New Slang" there were hints that we could just as easily see the band turn to straight out art/synth/electronic stuff. That's what happens with Broken Bells appropriately titled release Broken Bells. This an album that sounds just as lamentative and thoughtful as any Mercer helped create with The Shins, and the vocals are unmistakable, but the genre has bent just barely far enough to be considered something different. It's a project that was necessary given what we knew, and I can't imagine a reality wherein it doesn't exist. It fuses the slow-strumming quality of Mercer's other songs with something bigger and vaguely ethereal. But, in a lot of other ways, Broken Bells is the ideal follow up to 2003's Chutes Too Narrow. Jumping straight from the sad lessons and momentary joys the elder album to something that wholly embraces transition, loss, change and contemplation. Where Chutes Too Narrow opens with bounding, poppy delight, it closes with three of the saddest songs on any album: "Pink Bullets," "Gone For Good" and "Those Who Come." This would have been an incredibly point to rest, revive and rebirth, coming back as something that sounds wiser, refined, fragile and knowing, as Broken Bells does. My main gripe about The Shins 2003 - 2007 change in sound is that they gave up a lot of the fragility they held so tightly on their first two albums, but came back with songs that had a similar style and sound, but weren't as broken-heartedly sincere. Broken Bells, as a project, or perhaps a note of new creative direction, assuages that concern greatly. After all the love and lost and sadness ending the 2003 album, Mercer returns, now more knowledgeable, still fully aware of the complications of love and the philosophical difficulties in defining our lives, but presents it more sagely. What I'm saying in a circuitous way is that Broken Bells feels like it all fits together and fits the time line, while Wincing the Night Away felt like an album they had to make (as required by outside forces). I have, over time, grown to love The Shins' 2007 album, but it always seemed lost, asking "Are we the NEW Shins? Or are we the 2003 Shins?" Of course, I can ask this question as a listener, a fan, a critic, and it floats out there rhetorically. Broken Bells is James Mercer doing the kind of lyric writing and song writing to which we are all accustomed, but the new sound and mixing acts to refresh the sentiments. The album isn't loaded with driving indie pop/rock, instead content to plod and occasionally trot forward while the mood plays as much a factor in the "band" as the vocals, drums, organ, synthesizer, et al. If you've heard "The High Road" you'll know exactly what I mean, or at least what I'm trying to assert. Other tracks featuring awesomeness are: All of them. There's a lot happening despite the spacey, shoe-gazey tone. "Your Head Is On Fire" is a clear callback to early Shins-Mercer, but wobbling within a pseudo-psychedelia that relegates the acoustic guitar to the background. "The Ghost Inside" and "Sailing To Nowhere" are other winners. And while this isn't a perfect album, and its tone fades to more sad lamentation at the end, it is a new direction that could use even further explorations.